Languages : Rajasthani , Hindi & English. Temperature : Max. 42°C in Summer. Min. 3°C in Winter. Bounded by Udaipur and Chittaurgarh, was founded by Maharawal Jagman Singh. Home to the tribal and Bhils constituting half of the total population. The ancient town is surrounded by a stone-wall, now in ruins. There are many tourist places including temples, lakes, palaces, forts, etc. which are really a great interest of tourist. Green forests on the slopes of Aravalli hills with variety flora and fauna attract a large number of tourists from different parts of the world. Air: Nearest airport is Udaipur 160 km. Rail: Nearest railhead is in Ratlam (Madhya Pradesh) (80 km.) connected with all the major cities of the country. Road: No route in the district has so far been nationalized. Rajasthan, Gujarat and Madhya Pradesh roadways and the private travel agencies operates frequent buses and connect it to major cities of India like Ahmadabad, Baroda,Jodhpur, Mount Abu, Bombay, Ujjain, Bhopa, Udaipur, Jaipur, Delhi etc. 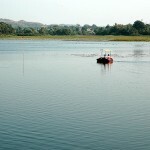 Anand Sagar Lake or Bai Talab: An artificial lake on the eastern side of the town constructed by Lachhi Bai. Beautiful chhatris of rulers of the state and an array of holy trees called “Kalpa Vriksha” famous for fulfilling desires of visitors. Dialab Lake: A beautiful lake covered with Lotus flowers. On the bank of the lake is Badal Mahal, the summer resort of the former rulers. Abdullah Pir: A popular shrine of a Muslim saint, attracting a large number of Bohra Muslim from all over during the annual festival. Madareshwar: A temple of Lord Shiva set amid natural beauty. Talwara: Talwara is situated 15 km away from Banswara in Rajasthan. A historic city with ruins of some ancient monuments and temples famous for their beautifully curved idols in local black stones. 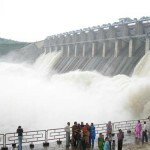 Mahi Dam: Mahi Dam is situated 18 km from Banswara in Rajasthan. Under the Mahi Bajaj sagar project, various dams and canals have been built over the Mahi River amid beautiful surroundings. The Mahi Dam has a picturesque fountain garden. Mahi River has a number of Islands at intervals and hence Banswara is at times referred to as “the city of hundred islands”. Tripura Sundari: Tripura Sundari is situated 19 km from Banswara in Rajasthan. An ancient temple of the Goddess Tripura Sundari, commonly known as Turtia Mata. The idol of the Goddess riding on a tiger is a magnificent one in black stone with 18 hands. 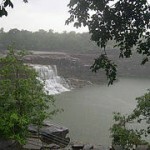 Parahera: Parahera is situated 22 km from Banswara in Rajasthan. A temple of Lord Shiva built by Mandalik, stands on the bank of the Nagela tank in the village. 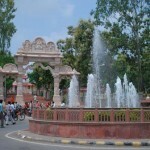 Deogarh: Deogarh is situated 85 km from Banswara. This magnificent fort was built in early 16 century near Pratapgharh, with some beautiful palaces ornate with murals and splendid Jain temples. This entry was posted in Banswara, Rajasthan and tagged Abdullah Pir, Anand Sagar Lake or Bai Talab, banswara city, banswara india, banswara map, Deogarh, Dialab Lake, Madareshwar, Mahi Dam, Parahera, Talwara, Tripura Sundari. Bookmark the permalink.